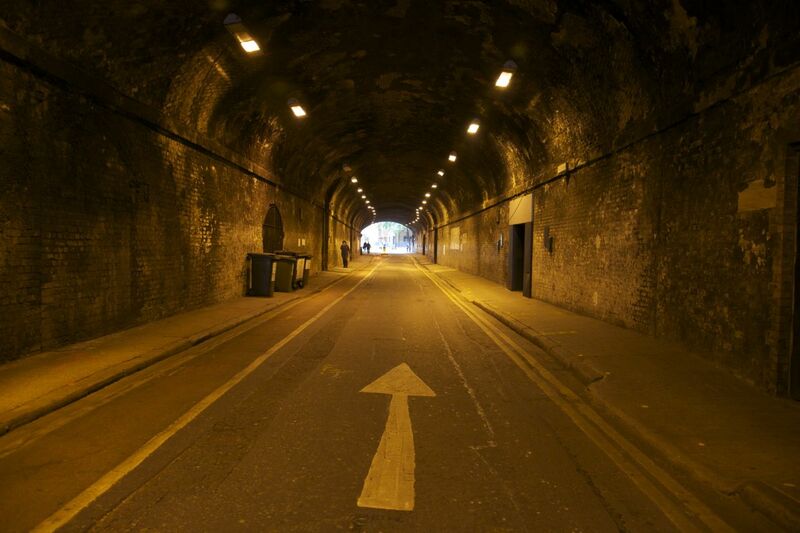 From their beginning, railway stations were often perceived as having a dream-like quality. For some – particularly early travellers – the station was like a nightmare, particularly when seen at night, when the sight of steam locomotives seemed to emblematize the destructive or apocalyptic energies the railway seemed to have unleashed. Margaret Oliphant’s novel The House on the Moor (1861) was probably the first to actually use the word ‘phantasmagoria’ in relation to the railways, which she applied in describing the shifting spectacle created by a steam locomotive rushing through a country station at night. 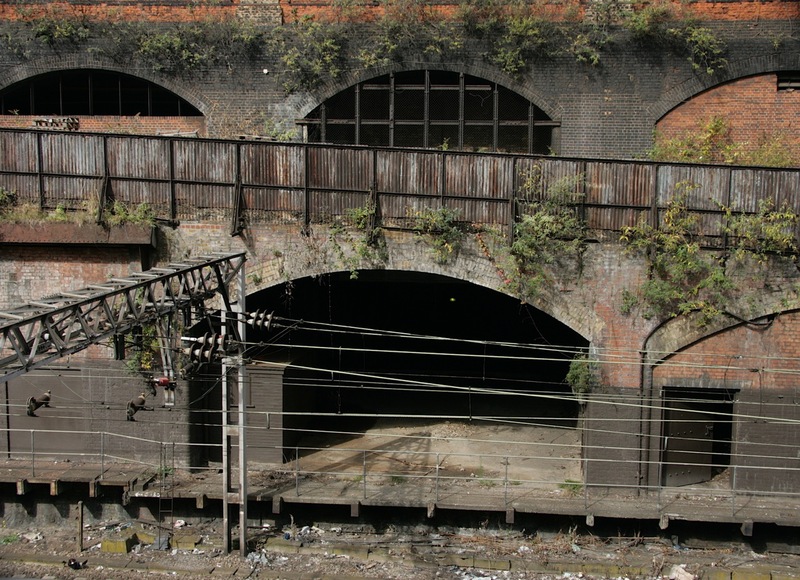 In later years, large iron train sheds became phantasmagoric for a number of reasons: for The Builder, ‘London Bridge recalls a nightmare or troublesome dream’ because of the ‘menacing girders’ of its enormous viaduct, ‘its impossible approaches, tortuous bridges, fearsome alley-ways, and cavernous entries’; while, for Filson Young, the light-filled train shed at Liverpool Street was counterbalanced by its ‘dark catacombs’ – hidden spaces that were full of the discarded remnants of hurried travel – ‘strange shadows, gigantic and discarded toys’ – where ‘you feel you have wandered into another age’. These nightmarish transformations of railway stations were generated by a long-standing anxiety about the loss of individual consciousness in the face of the railways, which transformed previously autonomous individuals into ‘atoms, pulsing, coalescing and dispersing across the network’, or ‘living parcels’ as John Ruskin had originally put it in 1848. 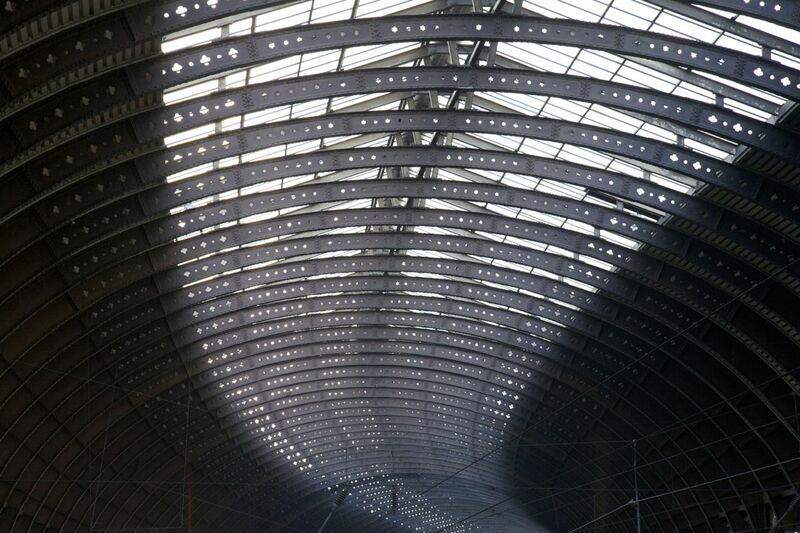 In addition, Walter Benjamin has argued that the prevalence of dream imagery in relation to iron structures like railway stations was not merely a metaphorical transposition, but a material one, where collective dream imagery was actually inscribed in the spaces themselves.In this sense, the perception of iron train sheds as nightmarish temples, their wrought-iron arches as the vaults of caves, or their girders as menacing objects, transformed their presumed ‘solid’ materiality into one that dissolved the boundaries between the real and the imagined, creating new ornamental configurations of material, structure and atmosphere. If some found the obliteration of individual consciousness perceived in railway stations as nightmarish, others embraced it as a stimulating dreams of a different sort that hinged on the individual’s linking with, what Henry James termed, a ‘larger way of looking at life’. Here, nighttime views of railway stations produced not nightmares but an ecstatic connection to a greater whole. So, George A. Wade, in his 1900 article on ‘famous railway stations’, described the ‘brilliant illumination’ of York’s train shed at night, which he viewed from the medieval walls of the city, watching ‘the grand curve of the rails through the station, with the northern expresses dashing towards Scotland’; while Paddington’s train shed became magical for The English Illustrated Magazine when seen at night, where the ‘innumerable coloured lights’ blurred the hard outlines of the iron structure, everything dissolving ‘in motion [and] rush, swish, and darkness’. Finally, when The Builder published its account of London’s railway stations in 1916, it also included a lithograph showing an up-to-date view of St Pancras’s vast train shed. 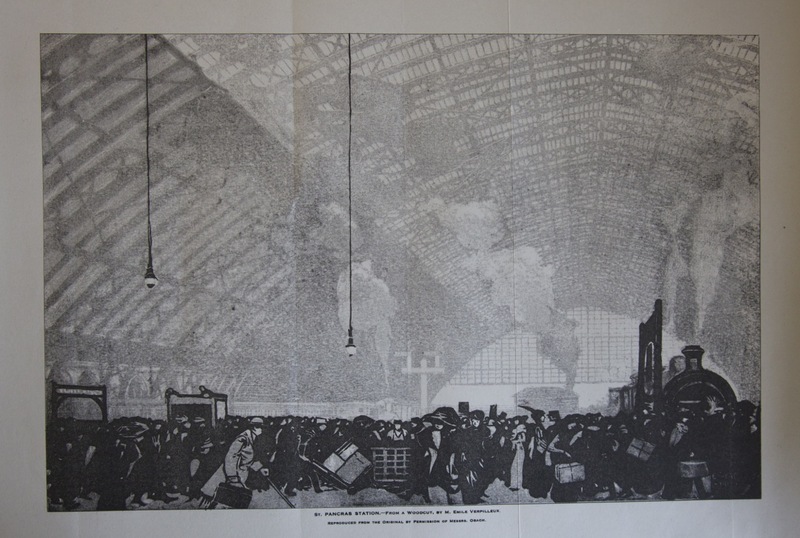 If the article drew attention to the softening of the ‘utilitarian … ugliness‘ of London’s termini by ‘the machinations of soot, fog, gas coal, and company’, the illustration pictured something of this softening in its rendering of the vast iron-and-glass roof, one that does indeed make it appear to be dematerialised by the clouds of steam rising from the engines below. Updating William Powell Frith’s mid-Victorian panorama of Paddington station (1862), this lithograph simultaneously magnifies the train shed, which here fills almost the entire image, and softens its utilitarian aesthetic so that it appears to dissolve into the sky beyond the vast pointed arch. And unlike Frith’s carefully differentiated crowd, the travellers in this image are truly a ‘mass’ – that is, the crowd that had become synonymous of urban modernity, and rendered here as an almost solid undifferentiated block of black ink. In short, this image creates a new aesthetic out of St Pancras’s utilitarian iron, in effect a dematerialized ‘mass’ ornament that emerges out of the dissolution of conventional perceptions of iron’s material solidity. Reblogged this on Decayetude's Blog. Paul, have u read Sebald: Austerlitz? : his descriptions of Liverpool Street station(pre refurbishment) with its below street-level nature and hidden nooks, like the ladies Waiting Room(if indeed it DId exist! )itself, grimy, soot-laden trainshed, echo your own relection on this station and others; there is also a spectrality and liminality around these sebaldian stations which u pick up on, interestingly, in ur reference to “loss of indicidual consciousness” in the face of the depersonalised industrialization the stations represented! Thanks for this. I have indeed read Austerlitz – one of Sebald’s best I think. I’ve used it in relation to thinking about what iron might mean in railway stations (particularly iron ornament). Railway stations are a big part of Sebald’s writing – they seem to be places which stir up memory very strongly but in a way that’s difficult to pin down – sites that connect the individual with the mass but in a fluid, transient way.